Got a cardboard box? 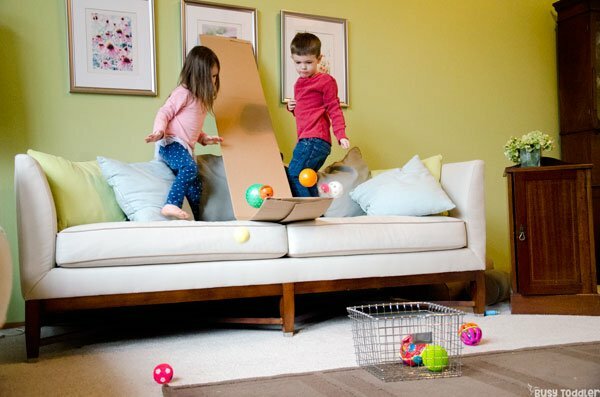 You’ve got to make this DIY ball ramp. What is it about toddlers and cardboard boxes? They are basically like peas and carrots and the stuff dreams are made of. 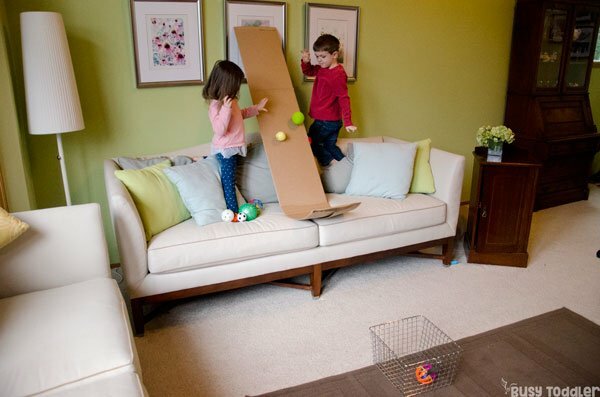 Usually my kids decorate their cardboard boxes but this day…I decided to turn it into DIY ball ramp. Cardboard boxes are magical – don’t ever forget that! 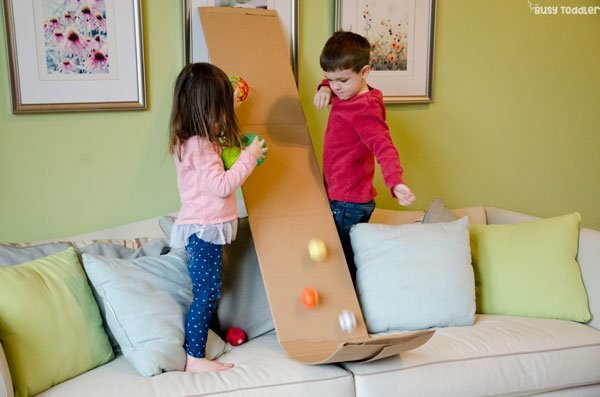 My kids love decorating their cardboard boxes (which we keep for months on end), making roads out of them, and have you seen this epic marble run from Frugal Fun for Boys and Girls? But they had never experienced the fun of a ball ramp until this activity. RELATED: This Ball Ramp activity is part of a week long series celebrating the upcoming winter games. See more on my “Toddler Winter Games” page. There was method to my madness as I made this ramp. First: I didn’t want it to just be a ramp. I wanted this to be similar to Ski Jumping (remember this post is part of my winter games series). I cut open the box so it was flat, then folded back the flaps and taped them down. Then taped my broom stick to the back. That’s the trick. Gotta make the ramp part nice and sturdy. For the bottom of the ramp, I folded up the bottom to make it curve just like a ski jump ramp. It worked perfectly. It was so worth the set up. Usually, I have a strict “this can’t take more than 1 minute to set up” policy. My favorite activities are always the easiest activities. But this was well worth the 5 minutes to set it up because my kids played with it ALL.DAY. Then all day the next day – basically until the floor was so dirty that I needed my broom back. At the bottom of our ball ramp, I added a target AKA a basket to catch the balls. The balls didn’t always make it into the target but having something to aim for made it just a little bit more than randomly rolling balls down a cardboard box. 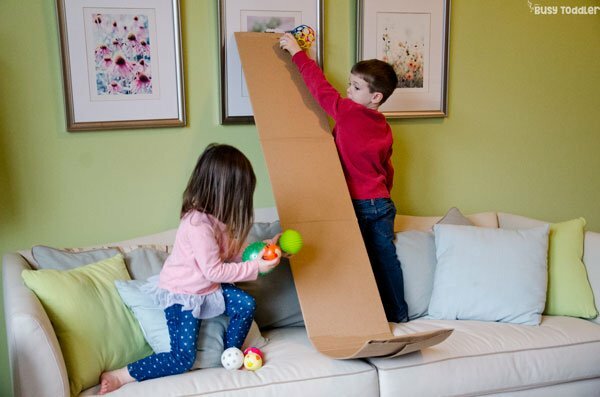 Cardboard boxes and toddlers – it’s a relationship that just never gets old. 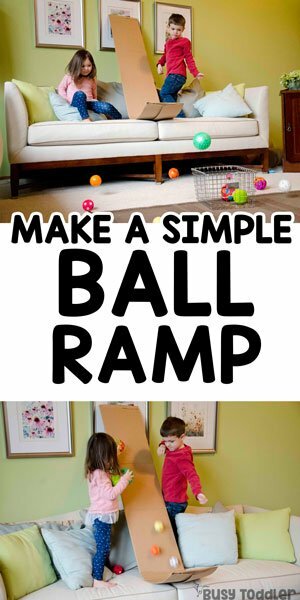 Buuuuut if you do need a change of pace, try making a DIY toddler toy (this ball ramp) as a fun random activity. Until I needed that broom back, it was one fabulous “toy” to have. 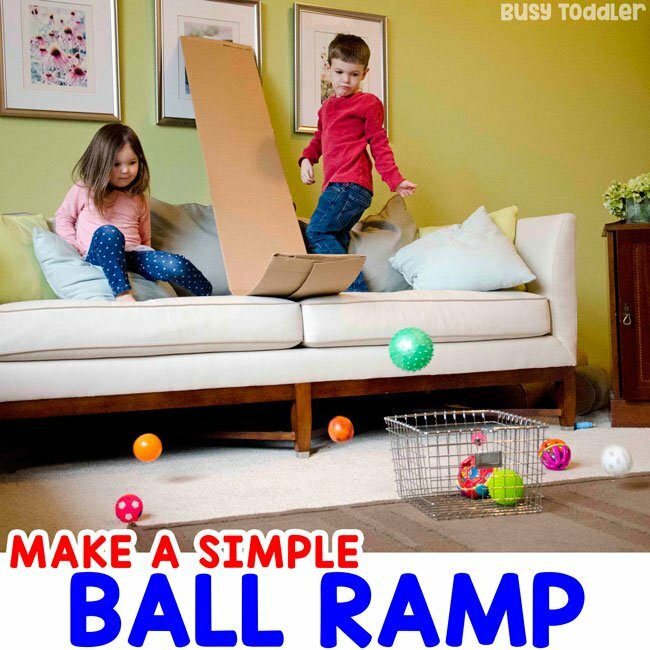 When will you make a DIY ball ramp?